Booth on the scene in "The Gunk in the Garage." The third episode of Bones' eighth season airs October 1, 2012. 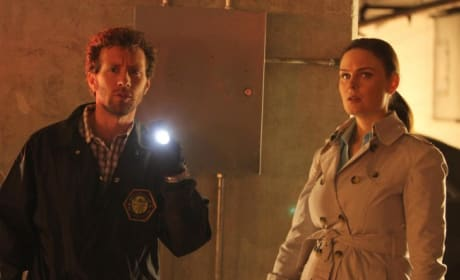 Hodgins and Brennan on Bones. "The Gunk in the Garage" airs October 1, 2012. 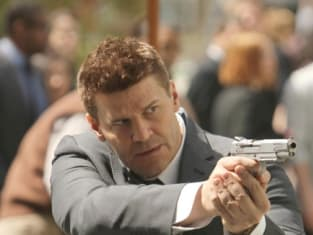 Sweets goes into the field with Booth behind a desk on Bones. The role reversal takes place in "The Gunk in the Garage," airing October 1, 2012. 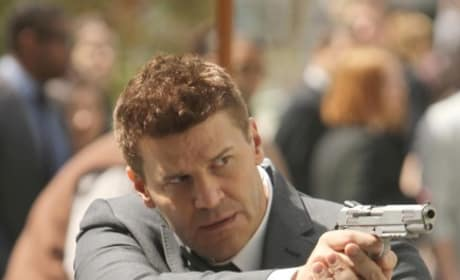 David Boreanaz as Seeley Booth on Bones. The FBI agent is back in the field. Hodgins: I've loved combustion variables ever since I blew up the multipurpose room for my middle school science fair project. First time I made it onto a watch list. Cam: Yeah, that's a lot less creepy. Booth: Don't do that. Not that look. Please. Don't give me the sad eyes. Booth: Ah, come on! No, I'm not looking. I'm driving. Booth: Oh, you were never able to do this look before the baby! What did the baby do to you? Bones Sneak Peeks: It Has a Name? Bones Promo: Can You Get the Big Pieces Off Me?